Is Your Pussyhat Keeping Someone Warm? 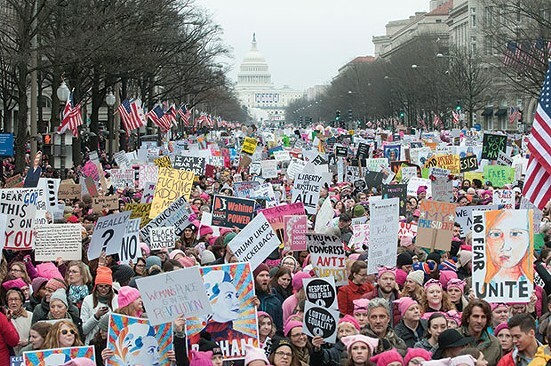 In photographs of last Saturday’s women’s marches in Washington, D.C., and around the United States, many pink hats are visible, most of them with ears, indicating solidarity with the Pussyhat Project that was so popular it caused shortages of pink yarn in some parts of the country. It’s obvious that many thousands of pink pussyhats now exist. Why haven’t I seen any of them this week? I live in the East End of Pittsburgh. This is a very liberal area where support for equal rights is seen as a good thing by the general public; it’s highly unlikely that someone would be harassed for wearing a feminist symbol in public around here. The weather has been warm for January but damp. I do see people wearing knitted hats. I haven’t yet seen a pink hat with ears, not even one. Where did they all go? If you have a pussyhat, wear it as your warm hat for the rest of the winter! Let it remind you and everyone else that this protest was not just a one-day thing but that we need to stand up for equal rights for everybody every day! If you have a pussyhat that you are not going to wear again, for whatever reason–please give it to someone who needs a warm hat or to an organization like a homeless shelter that will put that hat on a cold head. A warm hat can keep a person alive on a cold night. Don’t let that knitting go to waste! Share the warmth and keep America great! I’m sorry, but I don’t think this is wise. A crowd of people in uniform draw attention to the uniform. A lone person in uniform draws attention to herself. So you think that a pink hat with ears would really draw a lot of attention relative to what other adults in your area are wearing. I’ve been trying to figure out if it would, here, and whether I might have missed seeing the hats in casual wear because there are other adults wearing pink (usually women, but not always) and occasionally adults wearing cutesy animal hats (usually college students), so that a hat in a not-eyepopping shade of pink with ears but no eyes or other embellishments might not even catch my attention. It took me a couple of days to start consciously looking for them. Event T-shirts are like uniforms, yet some people wear them after the event and others donate them to charity, even if the event might be controversial. T-shirts from gay pride events are worn routinely around here, for example. After thinking about it more, I realized that what you said is, “It is unwise to draw attention to yourself.” Really? Always? Even to make a statement about our cultural priorities? Should we hide our opinions except when we are in a big crowd of like-minded people? The hats were designed as a political statement. Wearing one is a political statement. In a group, you’re saying that you’re with the group. By yourself, you’re saying the statement is so important you don’t mind being the only voice in the crows making it. That’s fine if you choose to make the statement. But you’re talking about giving the hats to other people who may not be aware of what they represent, just to keep their heads warm. That’s irresponsible IMHO. In that case, the responsible thing to do, if you are a privileged person who now has more warm hats than you need, is to wear the pussyhat yourself and donate your other hat to someone who needs it. P.S. I have now seen one pussyhat worn casually in public.